As our esteemed publisher/ editor remembers so well, Jamaica Plain is an area of Boston filled with cosmic consciousness, community concerns, and grass roots energy. 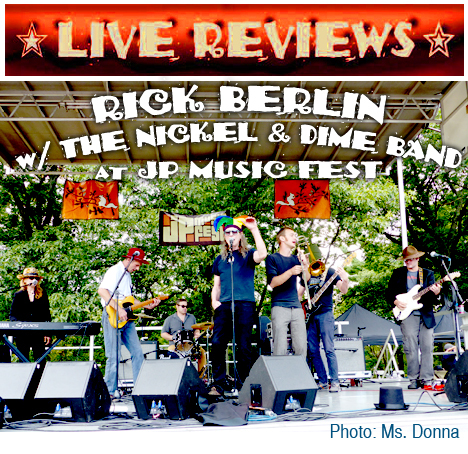 Thus, it is no surprise, select ardent organizers and premier local sponsors continue to present the seventh annual JP Music Fest, featuring 20 acts over seven hours. Oh my gosh – a massive undertaking! On a gorgeous day with two stages of non-stop music, local truck vendors, merch tables, and a field filled with hundreds of people! I met dozens of friends and basked in the good vibrations of 11 groups steamrolling their way through their 20 minute sets. I must admit, didn’t have the stamina to endure the complete show. No need for critique – just a wonderful potpourri of diverse entertainment. Pure bliss! Who I saw: “Sonny” Jim Clifford (solo punk blues, low down and gritty), chorus members of the Footlight Club (the oldest, continuously operating community theatre in the USA perform musical selections from two upcoming shows), Mamadou (world beat, reggae, Afro-pop with positive vibes and grooves), Bird Language (pop-punk quintet with ambient nuances – very impressive! ), Rick Berlin with The Nickel & Dime Band (all-embracing, snappy, sassy, always a bit kooky, performing songs from their newest album, The Courage of the Lonely), So Sol (new quartet with mixture of Americana and Latina music, spiced by exquisite lap steel guitar – the surprise hit group of the day! ), Nick & The Adversaries (mod-pop a la Elvis Costello, The Jam, or The Yachts), None of the Above (a cappella octet delivering show tunes and jazz-pop standards – great voices). American Echoes (twin sisters front a dark folk-rock quartet bursting with melodic energy – another great surprise! ), LOVE LOVE (rootsy Americana septet fronted by the dual vocals of the wonderful Chris Toppin and Jefferson Davis Riordan – fave song of the day – “I Like You Weird”) and Goddamn Draculas (winners of the 2014 Boston Rock ’n’ Roll Rumble unleash the toughest sound of the afternoon – razor sharp power-rock – whoa!). I leave totally satiated and promise to return again next year. Major kudos to Rick Berlin, Justin McCarthy, Charlie McEnerey, Shamus Moynihan, Ferris Mueller, Margie Nicoll, and many many others for whipping up such a potent brew! Musical moments like this make the world a much better place. This is undoubtedly the premier production of the Summer and has an all-star cast of national and local acts with both legendary and new up and coming future feature attractions. It’s like I died and went to rock ’n’ roll heaven. In the big picture, how can a mere mortal like me be tasked with comparing the talents of six stringers, Elliot Easton, Barry Goudreau, Rick Derringer, Mark Farner, Paul Nelson, George McCann (James Montgomery Band), and Gary Hoey? You just have to fasten your seat belt, keep your eyes and ears open, and enjoy everything. The Melody Tent has a stage that slowly moves around in a circle so every seat in the place is a good one and I’m sitting in the first row and can’t believe how fortunate I am. This is a spectacular show of bibical proportions and here are the most magnificent music moments: Elliot Easton backed by singer/ guitarist Charlie Farren, drummer Marty Richards (The J.Geils Band), guitarist George McCann, keyboardist Sandy MacDonald and bassist David Hull (James Montgomery Band/ Joe Perry Project/ Aerosmith). Elliot sings “Let The Good Times Roll” and Charlie vocalizes on “Just What I Needed.” During soundcheck they also play “My Best Friend’s Girl” but time limitations during the night limit all the performers to just a song or two, and it’s later dropped from their short set. This is not a new wave band and Marty Richards powers the songs like a steam roller and the walls of the tent shake. Great songs. Great new versions. Seeing David Hull and Jeff Thompson from The James Montgomery Band sitting down together before soundcheck making sure they were on the same page as they backed different musicians and do new songs for the first time was really cool. David: “…and at this part of the tune I’ll go ba ba ba da da da DA.” With Jeff adding “and then I go patatatatatatatat” as he drums on his legs, and it’s magical. Soundcheck is the only rehearsal of the night and these professionals get it perfect. One practice and they get it right. It doesn’t get any better than this. Barry Goudreau’s Engine Room with Brian and Marybeth Minehan Maes, Tim Archibald, and Tony DePietro do incredible covers of Boston’s “Smokin’” with Marybeth singing and making the audience roar in appreciation. Then they do a song from their new release about the death of Sibby Hashian “Time’s Gonna Heal” and finish up with this chestnut from his former group “Foreplay/ Long Time.” The James Montgomery Band’s rousing rendition of Chuck Berry’s “Never Can Tell (C’est La Vie)” gets the crowd on it’s feet. Short’y Billups, dressed in his purple top hat and blue suit lays it down for Wilson Pickett’s “Funky Broadway” and the packed house goes wild and dances in the aisles. It’s wild. Soulful sax player, Grace Kelly’s big brass talent takes it to another level with her version of “Amazing Grace.” Connecticut axe man Paul Nelson (The Paul Nelson Band/ Johnny Winter) and his bassist extraordinaire Jeff Howell (Foghat) do a stupendous slide version of “Slow Ride.” North shore six string maestro Gary Hoey plays “Boot Mill Blues” from his Deja Blues release to a loud and grateful crowd. James Montgomery introduces Charlie Farren as the “best solo artist in the United States of America” and Charlie afterwards tells me he performed “stripped down and honest” with just his voice and an electric guitar. He beautifully sings two new original songs “The Powers That Be” and “Hold Me Down And Love Me.” The show keeps getting better and better. Ayla Brown and her boyfriend Rob Bellamy have great harmonies and I really dig hearing their Americana tune “Always Have A Home.” They sometimes look into each other’s eyes and sing to each other onstage and it’s sweet and sentimental and comes out in their duets and their beautiful harmonies. Future local stars blues guitarist Aaron Norcross impressed the house with a Stevie Ray Vaughan version of “The Sky Is Crying” with Montgomery on harp. Fourteen year old Nicole Michelle and her great vocal take on Carrie Underwood’s “Must Be Something In The Water” makes me like her version much better. Chantal Joseph’s passionate cover of Stevie Wonder’s “Superstition” is eloquent and exciting. And Jordan Renzi’s original “Fly All Night” from her Featherbed Lane EP is rock solid and gets a lot of appreciative applause. Throughout the night, The Uptown Horns (The Rolling Stones/ The J. Geils Band) with Arno Hecht, Crispin Cioe, Bob Funk and Larry Etkin back up several artists and blow the roof of the tent right off its stakes. Rick Derringer, his band left handed bassist Charlie Torres and Kenne Moutenot pounding do “Hang On Sloopy” and “Rock And Roll Hootchie Koo” and show Cape Cod that you’re never too old to love loud and pulse pounding rock ’n’ roll. Headliner Mark Farner has everyone in the house singing along with his songs “We’re An American Band” and “I’m Your Captain.” Hearing 2500 people screaming “we’re getting closer to my home” is still a moving experience whether you are a teenager or in your sixties. When Farner does Grand Funk’s “Some Kind of Wonderful” Montgomery and Ayla Brown walk out onstage and add their vocals and the place goes nuts. After this spectacular show there is an after party across the street at the Cape Cod Resort Hotel and James Montgomery and Gary Hoey jump on stage with The Red White and Blues Band to continue the extravagance even deeper into the night. Two things I really smile: after meeting Mark Farner from Grand Funk Railroad, I talk to him another four or five times later on throughout the evening and each time he remembers my name and mentions it. It makes me grin. And second, before soundcheck I accidentally and momentarily get locked outside on a hotel room’s small porch with Derringer’s band and we almost miss soundcheck. I might have been tarred and feathered if we had remained absent. Best show of the Summer? This was the best show of the year!